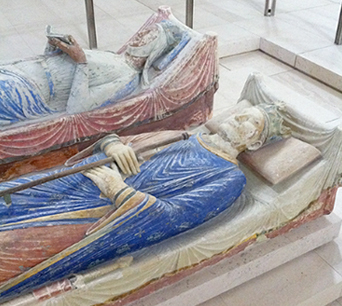 Although Henry's relationship with his wife Eleanor of Aquitaine had always been a passionate one, Eleanor eventually became increasingly resentful of Henry's promiscuity particularly with the royal mistress Rosamond Clifford as well as with Henry's reluctance to relinquish any authority in his kingdom and she retired to her court at Poitiers both to plot the downfall of her husband and also to plan the advancement of her favourite son Richard. In 1173, the pompous Henry the Young King along with his brothers Richard and Geoffrey all joined with their mother Queen Eleanor in rebelling against Henry. They were joined by the King of France, William of Scotland and even some of Henry's barons who had been outraged by the murder of Thomas Becket but in spite of this alliance against him, Henry managed to crush the rebellion, force the submission of the Scottish King and place Eleanor under house arrest. The only son who appeared to stay loyal to him was John.